Without question, the demand for change displayed by Canadians in the October 19 federal election was enormous. 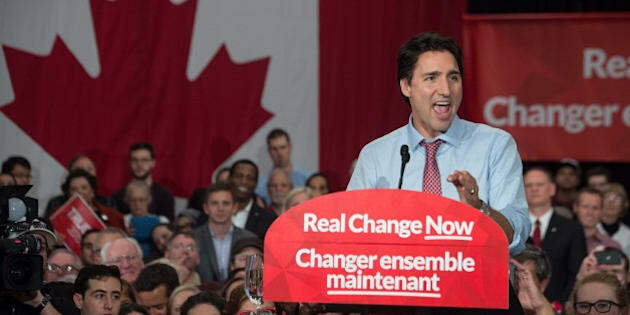 From the moment the returns from Atlantic Canada started to roll in and the entire region was painted Liberal red, it was clear there was an insistence that was going to spread from coast to coast to coast that Canada would have a new government and a new prime minister. As found in the exit poll conducted by Ensight on October 20, Canadians had tired of Prime Minister Stephen Harper and, over the course of the lengthy 78-day campaign, had found their alternative in Justin Trudeau. At the outset of the campaign, it was widely believed Harper called a long writ period as a tactic to his advantage; in the end, the lengthy campaign gave Canadians more time to get to know Trudeau, and gave the Prime Minister-designate the runway room to be consistently good every day for two-and-a-half months in the spotlight. By the time voting day rolled around, his charisma, engaging manner, values and differentiation won the day and was a major driver in people's decisions to vote Liberal. In fanning out across the country, we found that voters wanted no more of the insular, unco-operative and mean-spirited approach of Harper. They cited his muzzling of scientists as an indication of the man, and were disgusted that he tried to use the niqab as a wedge issue. In the early days of the campaign, much of the anti-Harper sentiment was coalescing under the NDP banner, but as the days wore on Canadians simply were not engaged by Leader Tom Mulcair. In Trudeau, they found a presence that was almost healing; they wanted more openness in government, more transparency and more co-operation, and that was the language Trudeau was speaking. With this change in government, Canadians are willing to give Trudeau some wiggle room. While they are anxious to see him begin to move Canada towards a proactive response to climate change (an issue many believe is a problem, is the result of human activity and was willfully ignored by the Conservatives) and would like to see progress on Aboriginal issues, they are not putting pressure on Trudeau to act quickly. Rather, they are asking for a more open, consultative approach. But this latitude is not without an expiration date. There is no doubt Trudeau will face difficult decisions down the road, and it will take deft political skill -- and him sticking to his word about running a more open style of government that is fiscally responsible -- to prevent the coalition of voters that got him elected from falling apart. That challenge may arise in Trudeau's economic policy. Voters paid only limited heed to the Liberals' various tax proposals to boost the middle class, but they are interested in his plan to use deficit spending to finance infrastructure projects. While there is a general preference for balanced budgets, Canadian voters acknowledge and accept that the current economic climate requires deficit spending as a form of economic stimulus. But it's also the issue where they will be watching Trudeau most carefully. In exchange for granting Trudeau the leeway to spend in the red for three years, Canadians expect to see results. Not so much in the form of new highways and bridges and stronger public transit (while these are important too), but in the form of jobs. Across the country, without question, the top concern for the economy is sustainable, long-term jobs for Canadians, and Canadians are not yet convinced that infrastructure stimulus spending or multi-national free trade deals are going to achieve that. So, they will be watching closely. But in the end, beyond the policies and the issues, Canadians found something intangible in Trudeau, something that wouldn't appear in a party platform or policy brief. It helps that he is the son of a former prime minister, because it came through crystal clear in our research that Canadians would like to forget much of the past decade and go back to days of yore. There is a definite nostalgia for the way Canada used to be. Canadians accept Trudeau's desire to recast Canada as a global peacekeeper, and to live up to our reputation as a caring and compassionate society. Interestingly, those who are hearkening back to the familiar, more traditional perception of Canadians are more likely to be newer residents of our country. They came here for a sense of community and co-operation. Over the past decade under the Harper government, they felt that was slipping away. The hope is it will be re-discovered under Trudeau. To view the full report from Ensight's Post Election Research, visit ensightcanada.com.